Minnesota Democratic Congressional Candidate Ilhan Omar speaks at an election night results party on Nov. 6, 2018, in Minneapolis. 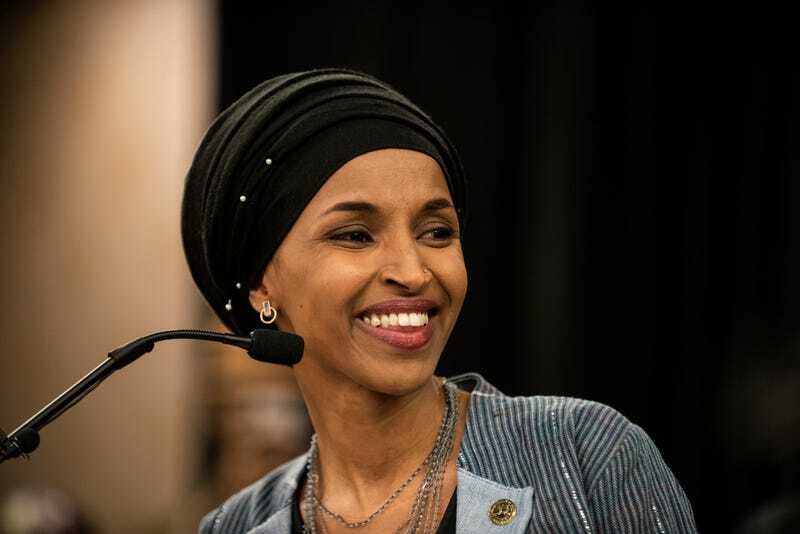 Omar won the race for Minnesota’s 5th congressional district seat against Republican candidate Jennifer Zielinski to become one of the first Muslim women elected to Congress. There might’ve been a blue surge during the 2018 midterm elections, but the “wave” Democrats were predicting turned out to be, in the words of some, decidedly pink. A record-breaking number of women ran for elected office this term and made history when at least 100 of them (at last count) won the congressional seats they campaigned for, primarily in the House of Representatives. This bests the prior record of 85 women representatives of the 435 seats in the House. Notably, over 30 were first-time elects, and the majority of the women running this year were Democrats. Additionally, Texas may still be left with Ted Cruz, but elected its first Latina congresswomen, Sylvia Garcia and Veronica Escobar (who will assume Beto O’Rourke’s former seat). Democrats Deb Haaland (New Mexico) and Sharice Davids (Kansas) will become the first Native-American women to serve in Congress—Davids also becoming the first openly LGBT member from her traditionally red state and only the second lesbian in Congress. And, after unseating 10-term incumbent Michael Capuano in the state primary, newly elected representative Ayanna Pressley is now Massachusetts’ first black woman elected to Congress. What will this mean for the future of American government? Aside from increased representation—and hopefully, advocacy for the issues of women and people of color across the board, many have speculated that women are more prone to be effective at bipartisanship, as well as taking a more humane approach to issues like healthcare. Of course, those are gendered speculations, disproven by the over 50 percent of white women who seemingly voted against their own interests (and the candidate who most clearly represented them) in the 2016 presidential election. But with a Congress that is more diverse in gender, age, sexuality and race, what is undeniable is that the long-running specter of an “old, white, straight male”-dominated government just became less threatening.